It would be great if business was always steady, but the reality is you’ll probably have super busy seasons or months, and times that are much slower. It’s one of the biggest challenges small business owners face – one month you are busting at the seams with work, the next, you’re waiting for someone (anyone) to call. 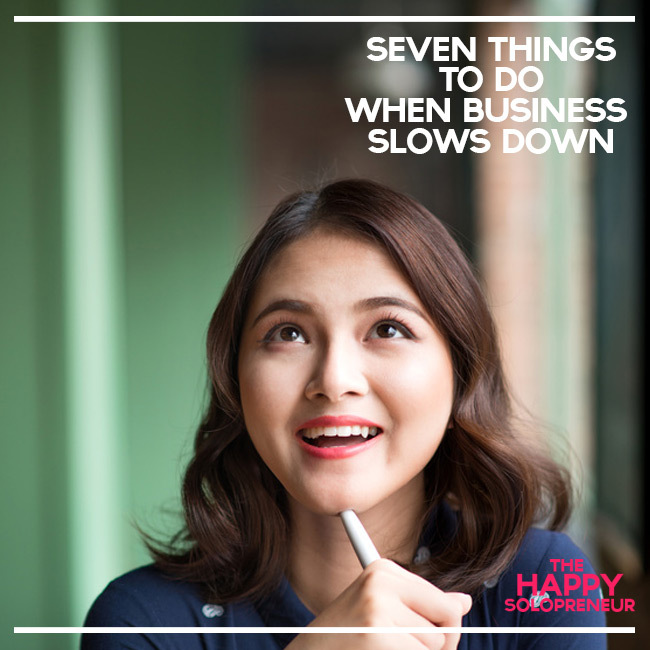 If you are used to being super busy and then all of a sudden business is at a slow down, here are some tips to stay productive. Is there a business or technical skill you have been wanting to learn? If your workload is lighter, consider taking a class. You can explore taking a class or workshop from a local college, a continuing education school, or better yet, an online service. I love Skillshare, Udemy and Skillcrush for easy to follow and relevant online classes. These site all provide classes that are affordable, and offer a convenient way to get a new skill. If you feel like you are flying by the seat of your pants when you are super busy, take some time to get organized when things slow down. Think back on your workflow, figure out what documents and processes might make working with clients or running your business more efficient. Clean up your contact list, organize your files, evaluate project management software, and create new client or project onboarding processes. Ever considered launching a product of your own? If business is slow, now may be a great time to give it a go. You can write an ebook, create an online class, make an informative video series or even launch an online community. Looking for a great plan to get started? Check out this series from Melyssa Griifin on launching an online product. If you are feeling like you aren’t sure what to do next, it may be a good time to pull out your business plan ( or any strategic planning documents you have created) and review. Many times we’ve already written down action items that may help when business is slow. There have been so many time I actually created notes and plans with new marketing ideas, only to put them away and forget about them. Sometimes two heads are better than one. If business is slow, consider finding a strategic partner. This may be another business owner that offers a complementary service to yours. You can do joint workshops, create marketing initiatives together or cross refer potential cliants to each other. If you send out emails to your clients or list, take advanatage of downtime by planning and writing all your upcoming emails in advance. Once you get busy again, you will already have your emails created and ready to go. There are so many inspirational and how-to books on my radar I miss when I am busy. So when things get slower, I find it’s a great way to a few minutes to reading things that are relevant to my business. Looking for some titles? Check out our reading list.